Leveraged loans have seen an uprecedented rally with yields peaking at over 18% in mid December 08 to just above 7% now. Very few new loan deals have been done, as the new issue pipeline has been primarily focused on bonds, including secured bonds. At the higher end of the spectrum and above secondary market yields, are smaller new money transactions like TNS − one of the first tests of investor appetite this year. TNS was sold at 90 and had a 600 bps spread and a 3.5% Libor floor for a 12.7% yield. 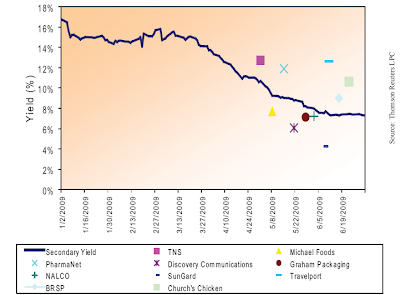 Church’s Chicken was priced at LIB+750 with a 2.5% Libor floor and a 98 OID for a total 10.6% yield. For larger names, yields have been lower, especially for amends and extends. These don’t necessarily take pricing to market levels as lenders’ return is boosted by amendment fees and coupons higher than the original credit. That was the case with SunGard, which at a spread of LIB+362.5 and a 25 bps amendment fee with no floor offered a 4.2% yield. With regard to the older leveraged loans, the picture continues to look shaky. Those who faced immediate maturities either rolled or refinanced in the bond market. Many of the rolls were forced - that is the lenders had to exchange old loans for new ones to avoid the company from going into default. 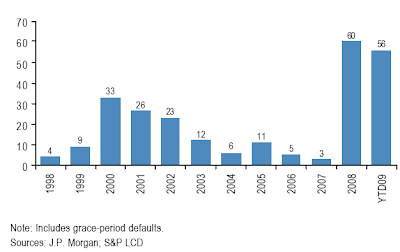 These actions reduce the expected default rates in 09-10, but to some extent just delay the inevitable. Recoveries for defaulted leveraged loans have been low and trending down. 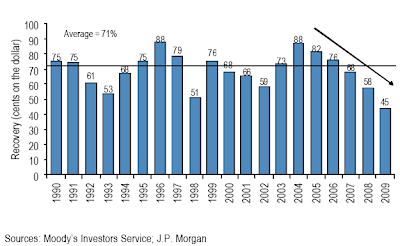 The old assumptions of 80-90 recoveries are out the window.